Alcoholic. It’s a tricky word. In the 12 Step tradition, admitting we are powerless over alcohol is the first step. That’s when we own the word. For a long time though, I had a different definition in mind - one that excluded me! And if I’m honest, I have to admit I may have changed the definition a few times as my problems got worse. I almost never drank during the week. Certainly not during my work day, and in the evenings I had work to prepare for the next day. Sure, occasionally I’d get a beer with some of the guys, but mostly not. Oh, but the weekend. Weekends are for partying! And I did. I was one of those guys always lining up shots and throwing them back. Sometimes two at a time. I have a big personality and it’s even bigger on the weekend, if you know what I mean. My friends liked that I kept the party going. Over time, I starting doing blow to keep myself in the game a bit longer. It made me feel like I was in control. Sort of. Sundays were a mess. I’d get home late and drag myself out of bed Sunday afternoon for Bloody Marys, if I was feeling social, or at least a beer or two and a bunch of advil. Over time, I got more and more useless on Sundays. Looking back, that was okay compared to what came next. In recovery, we talk about the “yets”. I haven’t missed work because of drinking yet. I haven’t gotten a DUI yet. We tell ourselves that when those things start happening, that’s when we’ll start worrying about our drinking. But they haven’t happened, right? At least, not yet. Yeah, but they do start happening. And this was when I started changing the definition of alcoholic. My definition. The Yets started showing up. The DUI, for example. Waking up Sunday morning in places I didn’t remember going, and wondering how my face got bruised. Eventually, I found that when I went out for a beer with the guys after work, I started following the beers with shots. And, well, next I found myself drinking shots alone at the bar because the rest of the guys had gone home. 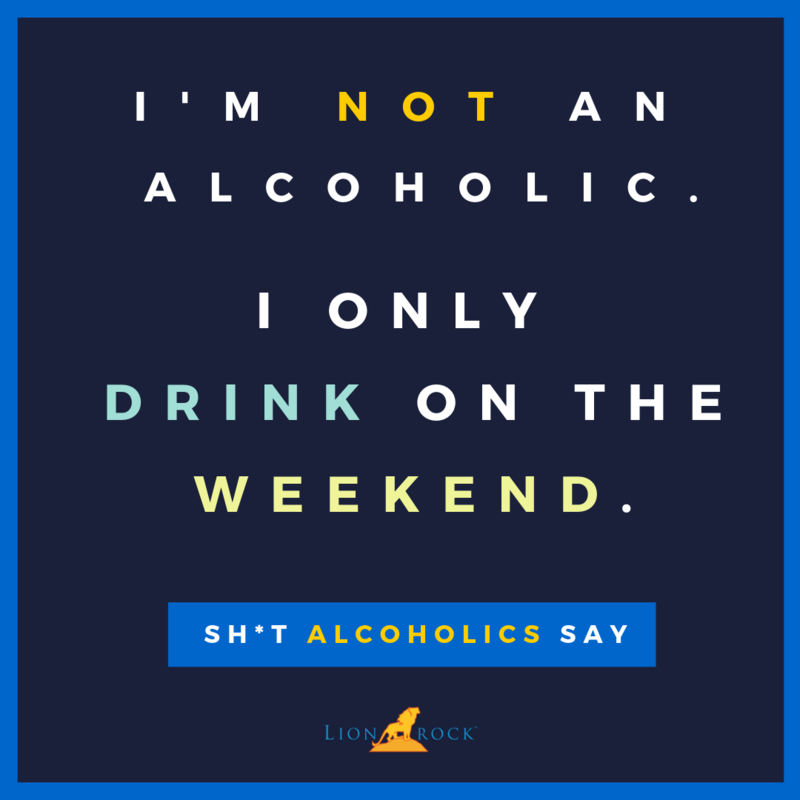 But those things did not make me an alcoholic! Because I’d never missed work because of drinking. Yet. Of course, it was just a matter of time until I did miss work because of drinking. I nearly lost my job. That’s when I reached out for help. The first thing I learned was that it doesn’t matter how you define alcoholic. What matters is how alcohol is affecting your life. Is it screwing you up? Keeping you from the things you want? Do alcohol and trouble show up at the same? Looking back, I see they showed up together a lot. There had been lots of reasons not to get sober. One of the biggest showstoppers was how could I ever have fun again? How would I make friends? Get a date? Wasn’t my whole thing about getting ripped and rocking out? I certainly thought so. But I was wrong. I found out that alcohol is not me and I am not alcohol. That felt like a very, very big idea. Let’s talk about that another time. For now, I just want you to know that it’s not about the how, the where, the when, or the how much. It’s about whether alcohol and whatever else you’re doing are screwing up your life.